Often seen by water Salix x Chrysocoma is a large fast growing deciduous tree with narrow green leaves and golden yellow winter twigs and strong pendulous growth. 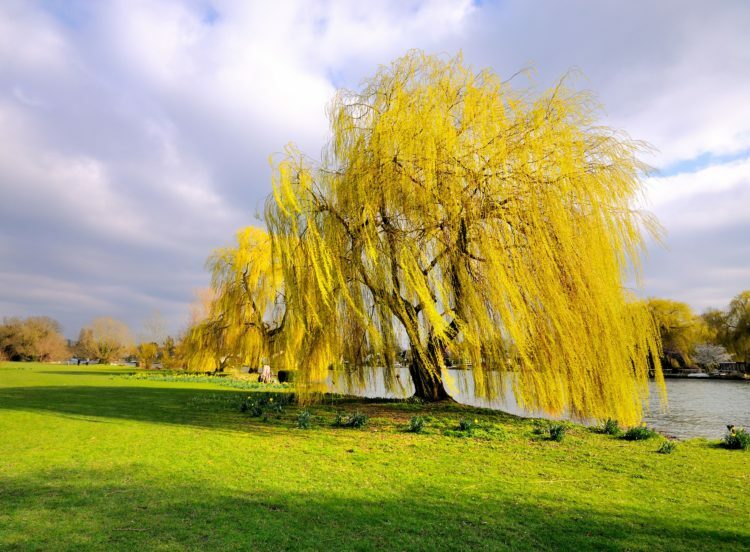 Golden Weeping Willow (Salix x Chrysocoma) an ornamental cultivar of the Salix family native to China, is one of the most dignified and majestic trees, often found at the waters edge. With its weeping habit, when raining, it is said that the water drops falling to the ground from the pendulous branches resemble tears, hence the name Weeping Willow. A spectacular large fast growing very hardy deciduous tree, producing narrow leaves and yellow catkins in spring, the leaves lasting until late autumn. It has an elegant weeping habit of golden yellow drooping branches from an open dome shaped crown, create a stunning curtain of greens and gold in summer and golden yellow bare stems in winter. Being such a large magnificent tree, consideration should be given when planting to the space allowed for the tree to develop to its true potential. It will grow in most soil and like all willows is very tolerant of wet sites. It is therefore extremely well suited to a waters edge with its shallow root systems. Growing at a rate of between 30-50cm per year, pruning is best done when dormant in the winter months and can be cut back quite hard if required. These are sold by us as bare root plants when dormant, usually between the months of November and March and also as taller pot grown trees which may be planted at any time of year. We like to provide as much help as possible and are happy to take a call if there is any other information you would like.